Mother of the Bride Outfit - Be Glossy In and Out! Wedding day is dedicated to the bride, she is the one who will attract all the attention, but somewhere there has a big role ... yes you guessed, is mother of the bride and she must shine in elegance as well.Wishing to be elegant, to make your children to be proud choosing the mother of the bride`s dress is one of the most difficult moment. Wishesbridal is an online brand which provides wedding dresses and occasion dresses where you can find the latest trends.Browsing their site you may find, among the huge collections, the dress which suits to your mother. When it comes about fabrics, lace is the most sophisticated, elegant, provocative and versatile fabrics and it is preferred by all women. A navy and coral lace mother of the bride dresses are a perfect choice because in such an outfit you feel always comfortable, confident and elegant. 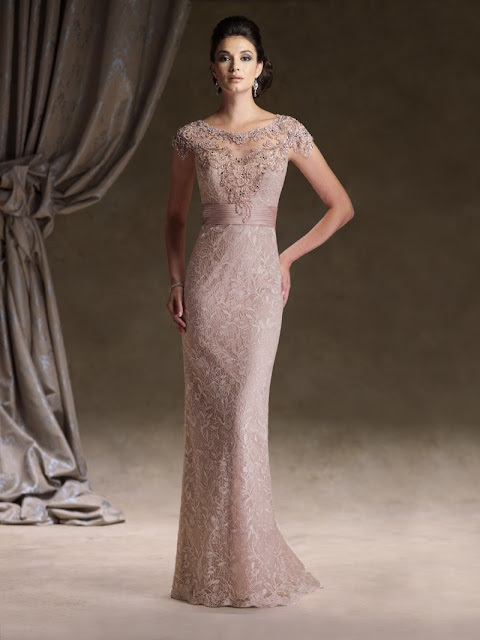 Explore a variety of mother of the bride dresses with sleeves in different length.A color very versatile and suitable for mothers of the bride is champagne color. Lace dress will always be an elegant option, perfect dress for a mother of the bride.